Is the Four Seasons Resort Bali at Sayan the best hotel in the world? The readers of Travel + Leisure magazine think so. They are so smitten with the Indonesian oasis that they rated it no. 1 on Travel + Leisure‘s World’s Best Awards 2018. Here’s why it landed at the top. Travel + Leisure magazine’s annual World’s Best Awards names top travel destinations and companies around the world by polling their highly attuned audience of globe trotters. This year, those readers rated Four Seasons Resort Bali at Sayan as the top hotel in the world. Four Seasons Resort Bali at Sayan is not a novel new property, however; it has a legacy of winning over hearts. The property opened in 1998, and ever since has been highly regarded in industry awards, reader polls and traveler reviews, and continues to elevate its services and offerings to anticipate the evolving needs of luxury travelers, according to Four Seasons. This is the second time that Four Seasons Resort Bali at Sayan has been recognized as the best hotel in the world by Travel + Leisure, having won the award for the first time in 2005. So what can you expect when you visit Four Seasons Bali at Sayan? The resort is nestled among the tropical forests of Ubud overlooking the Ayung River Valley. Its dramatic entrance is through a bridge, beneath which the sacred valley spreads its tropical arms, then descends through a valley of towering trees, tiered rice paddies and enchanting gardens. Guests can stay in one of 18 spacious suites and 42 private villas with private plunge pools. The property extensively uses flowing water to celebrate the Balinese heritage of nourishing the body and spirit with fresh water — this achievement is crowned with a gravity-defying rooftop lotus pond offering 360-degree views of the surrounding forests and river. 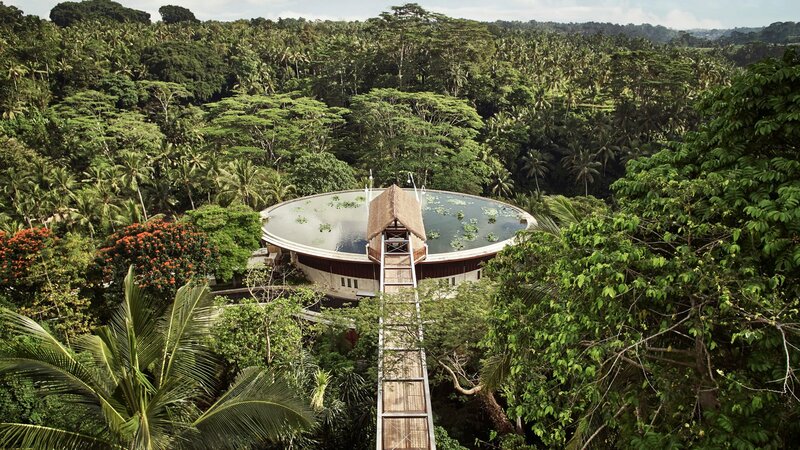 The spa at Four Seasons Bali at Sayan was one of the reasons it sits at the top of the Travel & Leisure list. The serene epicenter of relaxation offers everything of chakra ceremonies to meditation and yoga offerings in the riverside yoga pavilion, led by a wellness mentor and renowned yoga leaders through the masters-in-residence program. Visitors can also book a Balinese healer for a spiritual massage to enhance emotional and physical well-being. Puy taking a cooking class on your pre travel checklist. One of the newest highlights of the resort is their traditional Balinese cooking school, the first custom-designed riverside cooking school on the island. The Sokasi Cooking School, named after a woven bamboo box used to keep steamed rice, features a distinct bamboo design by Elora Hardy on the edge of Bali’s longest river – part of its UNESCO Heritage-listed subak irrigation network. Offering daily workshops and exclusive Chef’s Table dinners, it is the latest enhancement of the Resort’s immersive experiences, connecting guests with Bali’s cultural and spiritual heart through the local cuisine.